A special personnel figure is added to a unit and will allow the unit to perform one or more special actions. A unit with a special personnel figure will be labelled on a scenario map. When a special personnel figure is deployed in a scenario, the special personnel figure is added to a unit when setting up the battle giving the unit one additional figure. The figure is not transferable to any other unit. It does not count as a figure that can be removed to satisfy losses. When a player’s victory objective allows his forces to achieve a Breakthrough medal, each unit that exits the battlefield from an opponent’s baseline hex, gains the player one Permanent Victory Medal. To exit, the unit must be ordered and move off the battlefield. Moving from a baseline hex on the opponent’s baseline off the battlefield counts as one hex of movement to exit. A Tank model when it exits the battlefield gains the player two Permanent Victory Medals. 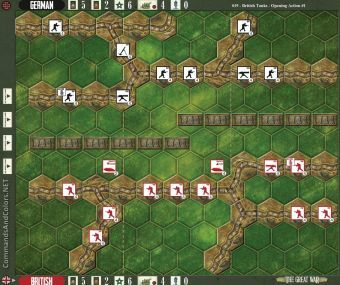 A unit must start its turn on an opponent’s baseline hex to exit off the battlefield to gain a breakthrough medal. 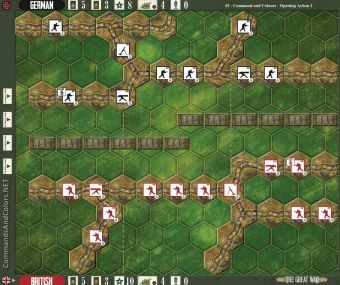 A player may not exit units from the battlefield when playing the “Rush & Rotation” command card and gain a breakthrough medal.